A novel fluorescent dye mixture is used in drop-cast PMMA (Acrylic) to store encoded data. Two types of dyes are used, one is photochromatic (sensitive to light) and one is thermochromatic (sensitive to heat). Each dye individually makes it possible to encode binary data, and combining them together allows for the encoding of quaternary data. 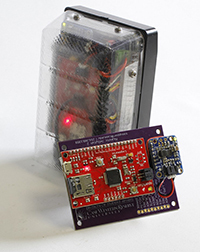 Chemistry professors Michael Kenney and Emily Pentzer developed this teaching aid to allows an instructor to face a recording device as they write, solving a major problem with online, televised, or streamed courses. 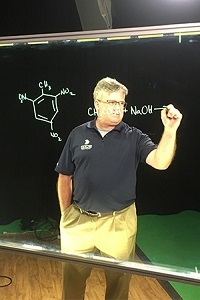 Previously the instructors were forced to turn their back on the camera in order to write on the board. 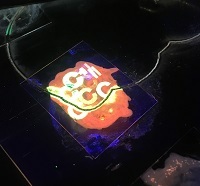 With the Light Board, the instructor can now write with perfect ease on a transparent, edge-lit acrylic window with fluorescent markers while facing the camera. A video filter mirrors the image so the writing reads normally and not backwards. 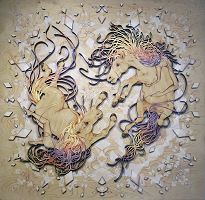 Suzanne Head is a fine artist who incorporates laser cut plywood for her drawing surfaces. Beginning with a series of sketches, she then scans the line work into the computer and traces the outlines to be laser cut out of plywood. Finally she draws on the cut surfaces and assembles the pieces to create her final composition. "Occupy Everything" is a demi-couture collection created for Kent State University's Annual Fashion Show, FS2: Crescendo. In collaboration with Kurt Nelson, a senior architecture student at Kent State, Kara Kroeger designed a 3D printed capsule accessory collection of bracelets, a belt, and shoe covers. The belt is visible in the photograph on the third model from the right. The other pieces are not shown in this image. This anatomical study uses the Hammond Todd collection at the Cleveland Museum of Natural History to look at how different cut angles for distal tibial osteotomies affect ankle alignment. Plastic replicas of tibia specimens with rotational deformities are created for the study using a combination of 3D scanning and 3D printing. In an effort to streamline the process of checking students in at large events, Case Western’s Student Affairs IT office designed and built several hand-held proximity card readers compatible with Case ID’s. This design costs less, has a greater capacity, and is significantly faster than the previously used magnetic stripe card readers. These card readers are now used for campus events such as the Career Fair and Thwing Study Over. 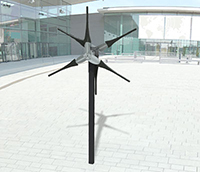 This patent-pending innovation in wind turbine technology involves two counter-rotating turbines connected through a novel drive train system. In this drive train, an "off the shelf" alternator is used to generate electricity, with one turbine used in the traditional manner to spin the alternator rotor while the second and counter-rotating turbine is used to spin the alternator stator by spinning the housing of the alternator. Testing data boasts a dramatic 30-35% increase in power output compared to traditional turbine arrangements, and decreases start-up wind speed to as low as 1 meter/second. 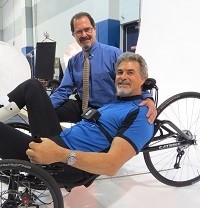 Advancements in implants are allowing individuals with paraplegia from spinal cord injuries to pedal recumbent trikes over ground with their otherwise paralyzed legs. This entry to the "Cybathlon" 2016 competition in Zurich, Switzerland utilizes an instrumented recumbent trike that senses crank angle and controls a surgically implanted neural stimulator to activate the appropriate muscles to propel the cycle forward. This adjustable-height stand-up desk, prototyped in think[box], is being used in homes, offices, and schools around the world. 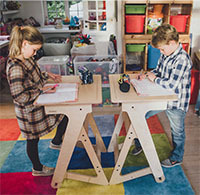 Stand-up desks have been shown in educational settings to improve focus and to cultivate a dynamic learning environment with improved teacher-student engagement. The company co-founders include Mathias Ellegiers, an alumnus of the CWRU MEM (Master of Engineering and Management) program. 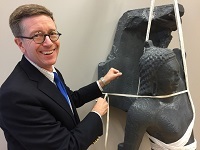 The government of Cambodia returned a sculptural fragment after 3D scans showed it fit a sculpture at the Cleveland Museum of Art. 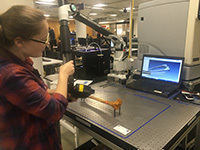 This collaboration between the Cleveland Museum of Art and think[box] involved a multi-day 3D scan of the museum's Krishna sculpture, followed by painstaking work aligning a scan of the fragment with the scan of the sculpture to see if the section in Cambodia belonged to the museum's monumental sixth-century stone carving of Krishna.